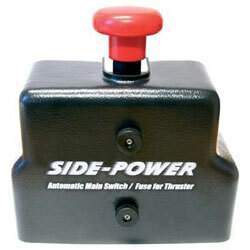 Side-Power Automatic Main Switch for S-Link System: Electric thrusters must have a fuse and a main switch / circuit breaker in the main power feed circuit for safety reasons. When there is an abnormal current consumption in the circuit the fuse will blow, but situations can arise when the fuse will not blow and it becomes necessary, for the safety of the crew, boat and those around, to shut down the main power to the thruster. The problem is that in most cases the main power switch / circuit breaker is a manual switch located in the bilge, technical room or even the engine room so that you will have to leave the control position to shut it off. Even boats with remote-controlled main breakers might not be easy to shut down either. Side-Power control panels have an Auto-Off function and the main switch will automatically shut off also and this problem is gone. With the new Side-Power Automatic Main Switch / Fuse product installed, the boats thruster system has ultimate safety and maximum user friendliness.